This will never be ok. In case you missed it in the glutinous trough of unimportant news like the Zimmerman trial, the miss direction of the illegal government snooping by having us focus on the whistleblower instead of the crime, or the Paula Deen witch hunt, there was an actual piece of important news going on. In fact it is literally a life or death situation. There is an actual life or death struggle playing out in the Texas State Legislature as I type. Weep for humanity, people. Just weep. The battle is over an abortion reform bill. And the battle is raging. The protesters of the bill are out in force and are as cute as ever. But, as cute as they may be, irony is lost on them. 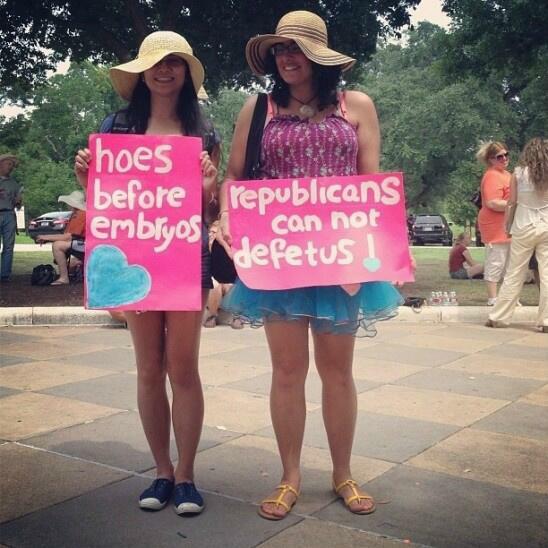 The link here: Pro-choice protesters will show you a myriad of posters and protesters at the Texas State House tonight. I’m not sure they thought a lot of them through before painting. The main thrust is get government out of my lady parts. Right, unless that means forcing tax payers to fund birth control and provide unregulated abortion houses, then by all means, get government right up in my lady parts. The proposed bill includes four restrictions on when, where and how a woman may obtain an abortion. The first provision requires doctors who perform abortions to have admitting privileges at a hospital within 30 miles of the clinic. Another bans abortions after 20 weeks unless the health of the woman is in immediate danger. If a woman wants to induce an abortion by taking a pill, the state will require her to take the pills in the presence of a doctor at a certified abortion facility. Lastly, all abortions must take place in an ambulatory surgical center. I’ve highlighted the second restriction because that is the public’s view of the issue. I think if you talk to the protesters of the bill they will tell you it’s the ramping up of the health standards on the abortion houses, causing a lot of them to close, that is the true crux of the issue. And the majority of the people who say that are full of crap. I say that because the restriction of 20 weeks unless the health of the mother is in danger says the opponents of the bill are full of crap too. Why wouldn’t you want the abortion houses to comply with strict health standards. Read that 2nd restriction again. It’s not outlawing abortion, it’s saying no abortion after the baby has grown for 20 weeks unless the continued growth or birth would harm the mother. Harm the mother. Wouldn’t abortion houses having strict health guidelines be beneficial to the carrier, or “mother” if you must? The people who want the right to abort babies will still have that right. They just won’t be able to abort babies who have somehow managed to avoid the abortionists forceps and surgical scissors for 20 weeks. Just for the sake of hyperbole, make no mistake, there is one preferred method for killing a child that has survived safely in the womb for at least 20 weeks. You have to take their head. Google Philadelphia abortionist Kermit Gosnell. You won’t believe it’s possible in this day and age that a supposed doctor could do that to another human being, let alone children. The point being women will still be using these places. Why not get them up to some sort of standard if the life of the mother is so precious, which it absolutely is by the way. I mean, we know the place isn’t safe for babies, it’s a literal kill zone, but why wouldn’t you want the place to at least be safe for women? Why would anyone want it to be the medieval house of horrors that was uncovered in the trial of Kermit the butcher Gosnell? Gosnell wasn’t just on trial for killing babies that had survived his botched abortion attempts or for his baby killing methods. He was also charged with murder of an adult woman who died in his torture chamber or “clinic” if you will. In fact the Texas bill addresses the exact things that the public recoiled at, and abortion rights activists choose to ignore in the Gosnell case. War on women, the activists are yelling in Texas. War on women? Wake up you dopes, this bill will make the whole baby killing environment safer for women. Anyway, the closing of the abortion houses is a red herring in my opinion. Raising the restriction from 24 weeks to 20 is what really frightens the protesters of the bill. It’s just that the issue of forcing the closing of abortion houses may be an easier battle, both legally and publicly. The rationale would be, if they can push it to 20 weeks, then why not 15 or 12 as in the case of Arkansas. If they can do that, then clearly they would be a stones throw away from banning abortion all together. Putting aside for a millisecond that banning abortion would be the right thing to do in my opinion, politically that’s an accurate thought. Especially when viewed in the big picture. President Obama is making it increasingly tougher for a democratic candidate to take the White House in 2016. If a hardline conservative or even a tea party candidate were to get to the oval office, the push for banning abortion might come up. It would be easier to do so if several states already had tough restrictions in place. Not to mention the fact that two of the oldest members (75 & 80 years old) of the U.S. Supreme Court were put there by a democratic president and are theoretically liberal. If one of them were to croak and the next President is a republican, the tide may turn. So strictly from a political standpoint I think opponents of the bill are more worried over the restriction of the age of baby that can be killed. Politics aside lets get some perspective of what we are actually talking about. What was his crime in the womb besides his mother not wanting him? …and of no value what so ever. 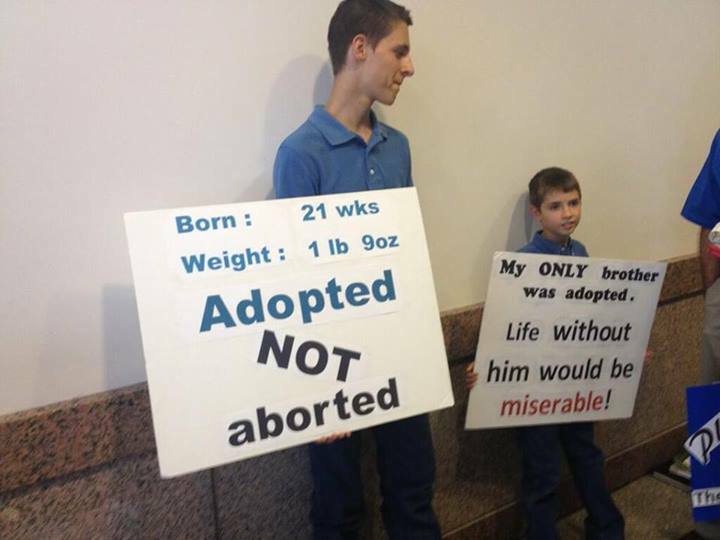 The first picture is of two young boys at the Texas State House. When they began to sing Amazing Grace along with the supporters of the bill, protesters shouted God is dead and Hail Satan. Haha, I love when there’s video. Look and listen if you can stomach it: Pro-choice correctly identifying their team. The last two pictures might look familiar to some of you. If you know me, you know her. It’s my daughter Anne Marie. She was born inside the current window for legal abortion in Texas. At 1lb 12oz and 12 inches long, we had little hope, but she made it. The picture of her holding my finger is telling. The girl is 25 weeks old in that shot. 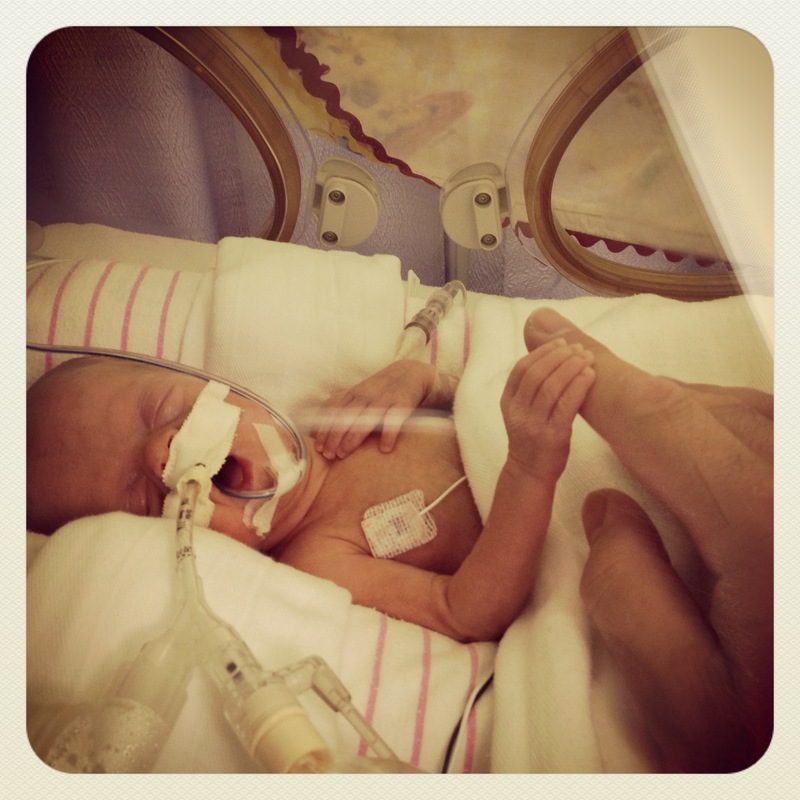 Yeah, she’s holding my finger. She doesn’t know it’s me, even though she turned her head when I or even Grammy spoke, but she can feel me. She’s alive, she was alive the week prior, and the week prior to that. Let me say it again, in that picture on the left she is one week older than her peers who are being summarily executed in states across the country. She is losing her peers to the abortionists blade at an alarming rate. Folks, that’s a person in that picture. There is no debate here. Killing her in the first picture is no different than killing her in the second in my opinion, although the current law says otherwise. Here’s another bit of irony. That’s a woman in that picture. Women packing the Texas State House right now are screaming and singing Hail Satan to win the right to choose to kill her. My government is charged with the common defense, protection, and welfare of it’s citizens, but my government, since 1973, wants people to have the right to choose to kill her.